Jonathan played soccer when he was a kid. He enjoys watching it from time to time, and enjoyed going to my sister's games much more than I did. 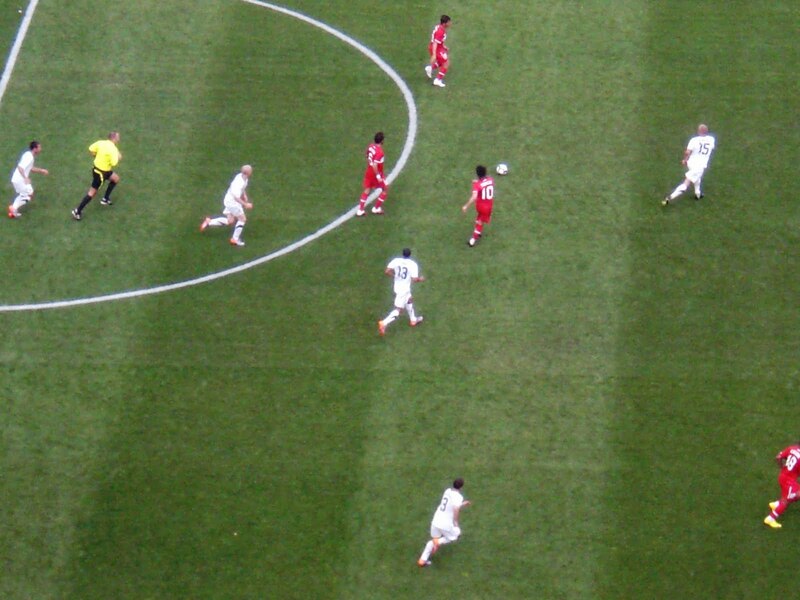 Truth be told, soccer is one of those sports that I have very little interest in. I don't even know all of the rules. It's probably the most well-known sport that I really couldn't explain to someone. But, I do enjoy rooting for the USA. As you may know, it's a World Cup year. Every four years (apparently. 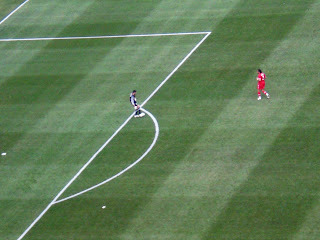 I didn't know that) there's some sort of international tournament for soccer, and it's in South Africa this time around. 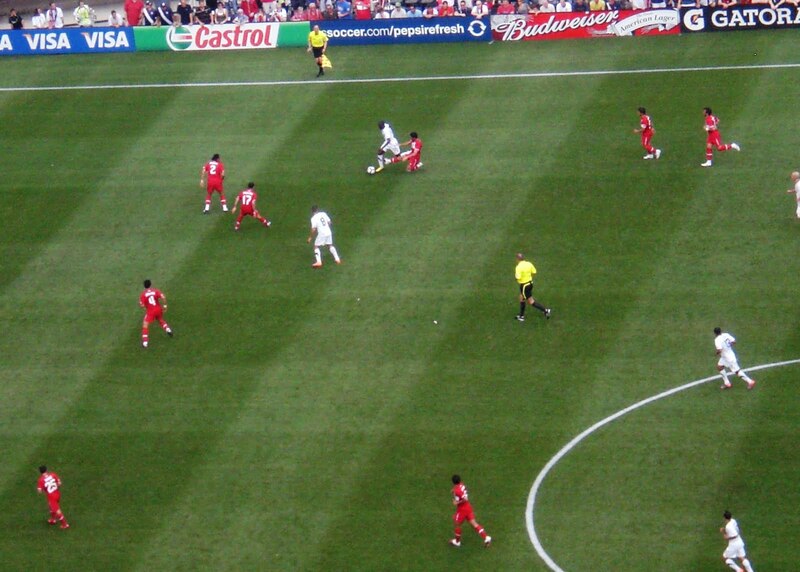 Well, Philly is bidding to host the 2018 or 2022 World Cup, so soccer has been big around here lately. Philly also has an MLS team (the Union) and there's been a ton of pushing tickets to their games this summer. 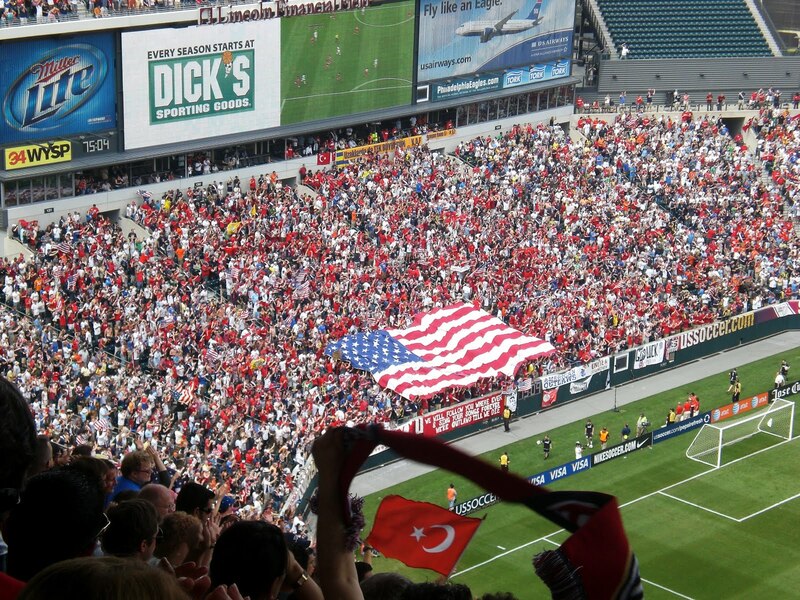 Anyway, Jonathan heard that Philly was also hosting the send-off game for the US National Team, against Turkey. 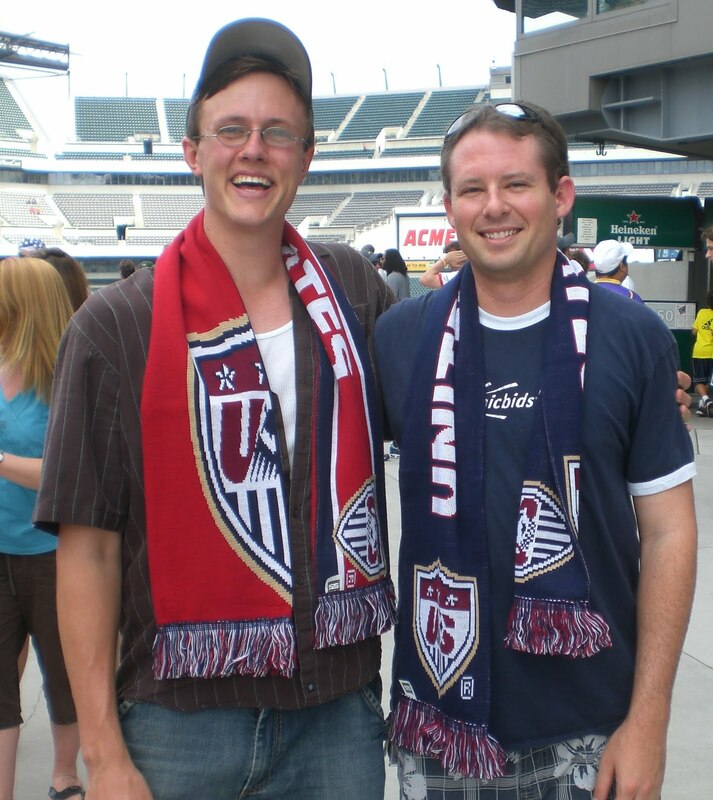 It's the last game they play before they head off to the other side of the world, and it was a mere thirty miles away. So, we went! And Rob came, too. We started out with plenty of time to spare, and it's a good thing we did, since we hit some bad traffic. On the way there we made a few stops (to get food and such), but when we weer about two miles from the exit, we hit stopped traffic. Apparently other people knew that there was a soccer game going on and decided to go, LoL. Luckily, it started picking up here and there and we were surrounded by some savvy drivers. That is, until we went to park. Then, the dummies started taking the wheel again and people seemed to have no idea how to navigate the sports complex and the parking situation there. We park, hydrate a little bit (it was boiling out! ), and start heading for will call. We inadvertently skipped several people there since the employees were not clear in the directions they gave for the entrance to will call. It went fast though, and we were then faced with the much-more-difficult task of actually getting in the gate. For some unknown reason (which we never did figure out), there were no lines, just a giant mass that wasn't moving. We were crammed in like sardines, which didn't bode well since it was over 80 degrees out (maybe even 90?). Somehow we started funneling in, and there was no bag check as we were whisked through the bars. At that point the game had started 2 minutes ago. It took us another 8 minutes to get to our seats (apparently the clock just keeps running in soccer... any time that was lost for substitutions and whatnot gets added at the end of the half! 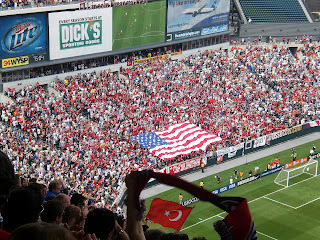 ), and although we were in the nosebleed section, we were covered, which is definitely a plus at Lincoln Financial Field. 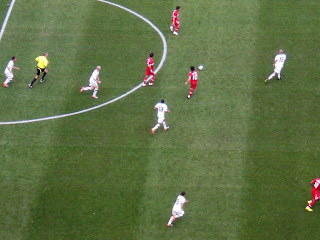 The crowds were amazing at the game, and it was really rather impressive to watch the US team in person. I mean, attending the Olympics is a big goal of mine in life (both winter and summer. I'm ambitious, I know), and this was kinda close, since I haven't been to an all-star-type event before. Here's a few photos of the game in progress. 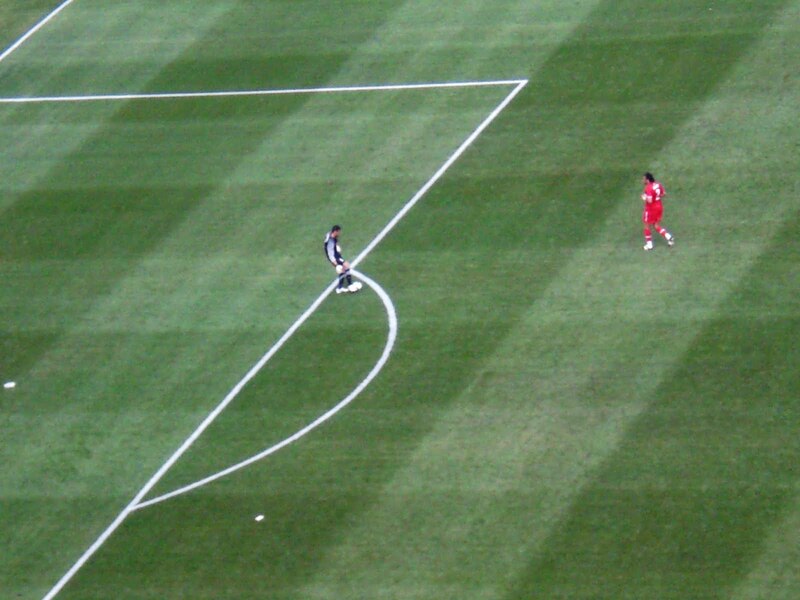 The US is the team in white, Turkey is in red. We stopped by the souvenir shop, and it was being completely mauled. The guys were fortunate enough to find scarves that they liked, and they are pretty cool. Rob truly had an amazing time, and nearly lost his voice shouting. Jonathan also enjoyed himself, and I was kinda thrilled with the camaraderie amongst the crowds. Go figure, if I can't be entertained with the event at hand, I'll just be amused with using audience reception theory. Yep, I'm a dork who went to grad school, LoL. 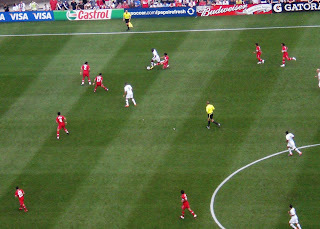 The score was close for a long time, and the end result was a US win, 2-1. This is actually really good, since Turkey is a good team (or so I'm told).